Central serous retinopathy (CSCR) is a problem that affects the macula. The exact cause is not understood. CSCR occurs when a small break forms in the pigment layer of the retina. Fluid from the layer of blood vessels that lie underneath the retina seeps up through the break, causing a small detachment to form under the retina. This problem is somewhat similar to a water blister that forms on the skin where fluid collects beneath the skin's surface, causing the layers of skin to separate. CSCR affects men more often then women and usually occurs between the ages of 25 and 50. Stress is thought to be linked to this problem. Corticosteroids can exacerbate CSCR whether they are given orally, intravenously, topically, or by other means. CSCR typically resolves spontaneously, but it can recur. In some cases, it may lead to moderate but permanent loss of central vision. Symptoms Signs and symptoms include blurred central vision, wavy, distorted vision, and a central blind spot. Diagnosis We can diagnose CSCR with an exam of the retina using ophthalmoscopy. 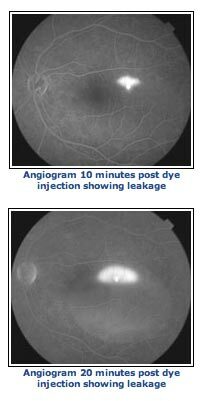 In most cases, fluorescein angiography is used to gather additional information about the extent and severity of the problem. A non-invasive test called optical coherence tomography can also be used to confirm the diagnosis and monitor its development. Treatment Most patients with CSCR do not require treatment. The fluid usually absorbs gradually over a period of months. Patients are advised to avoid corticosteroids if at all possible. This sometimes needs to be coordinated with the primary medical doctor if the patient is on corticosteroid treatment. In cases where visual recovery is delayed, laser treatment may be required to seal the leak and help the vision improve.